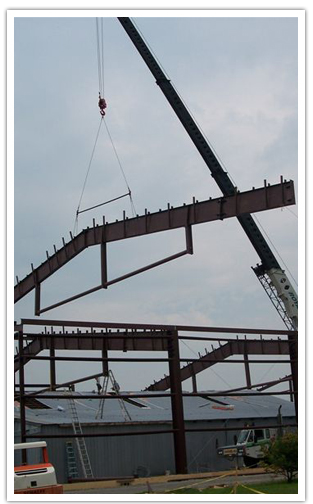 It will save you money and the loss of valuable time by assisting you with all of your steel building projects. Large or small, from a commercial metal building to a basic shop or utility structure, our experienced designers and engineers will help you develop and produce the building that will meet your needs and your local code requirements. Steel hold up to all forms of weather, it is fire resistant and compared to other building options, pre-engineered steel buildings can be up to 30% less to insure. Pre-engineered steel buildings are considered to be lifetime buildings because the power of steel makes it the ideal material for buildings requiring large open floor spaces such as arenas of all types, community centers, manufacturing and religious facilities. Steel buildings can have a clear span of 300’ wide. This gives the designer and builder an enormous space that is column free and adds the ability to satisfy complicated space designs while maintaining an unencumbered floor area. 1) SAVE MONEY! Steel is the least expensive material of all of the available construction materials. 2) Steel is more impervious to all forms of weather elements and is fire resistant. 3) Compared to other building construction, pre-engineered steel buildings will be up to 30% less to insure. 4) Pre-engineered steel buildings are considered to be lifetime buildings. 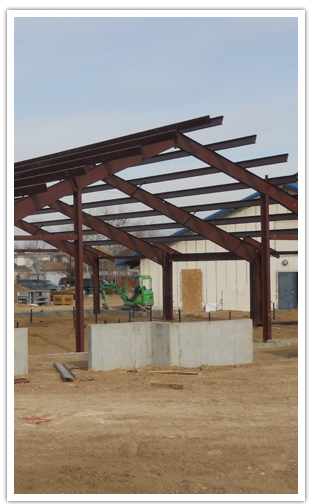 Pre-engineered steel buildings provide very low maintenance and upkeep. 5) The power of steel makes it the ideal material for buildings requiring large open floor spaces such as arenas of all types, community centers, manufacturing and religious facilities. 6) Steel buildings can have a clear span of 300’ wide. This gives the designer and builder an enormous space that is column free and adds the ability to satisfy complicated space designs while maintaining an unencumbered floor area. 7) Easier and quicker to construct than most construction systems, the pre-engineered steel building is less labor intensive, saving money and loss of valuable occupancy time. 8) One of the most significant benefits is that the design of your building is engineered to your local code requirements meeting the local environmental needs. 9) Our Steel Buildings are a pre-fabricated original product that is engineered to meet your particular design, unique exterior colors, needs and wants. Your building is pre-punched, precut, pre-drilled, pre-welded, pre-fitted and prepared to be assembled upon arrival to your location. 10) Selecting one of the many exterior options will make the exterior of your building look like stone, brick or stucco. You are only limited by your imagination. Pre-Engineered Metal Buildings (PEMB’s) are touted as one of the most environmentally friendly forms of building construction. PEMB’s are meticulously designed to provide the required building function with the least amount of construction waste. Also, steel is a recyclable material, adding to the green aspect of PEMB construction. Not only is PEMB construction “Green”, it allows for greater understating of the final costs and building time involved for your next building project. All of these aspects make Pre-Engineered Metal Buildings the ideal solution for large commercial and industrial buildings all the way down to smaller buildings such as shop and utility buildings or our ExpressLine buildings.